The fundamental difference between a radar level instrument and an ultrasonic level instrument is the type of wave used. 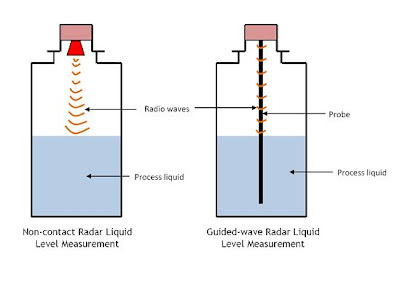 Radar level instruments use radio waves instead of sound waves used in ultrasonic instruments. Radio waves are electromagnetic in nature (comprised of alternating electric and magnetic fields), with very high frequency in the microwave frequency range – GHz. Non-contacting level measurement using radar has two main modulation techniques: pulse radar and FMCW (Frequency Modulated Continuous Wave) radar techniques. To calculate liquid level, the transmitter is programmed with the reference gauge height of the application(Ho as shown above) – usually the bottom of the tank or chamber. The liquid level is then calculated by the microprocessor in the transmitter. In the FMCW radar technique, microwaves are transmitted towards the product surface, but the transmitted signal is of continuously varying frequency. When the signal has travelled down to the liquid surface and back to the antenna, it is mixed with the signal that is being transmitted at that time. The difference in frequency between the received and transmitted signal is directly proportional to the distance to the liquid with high precision. The frequency of non-contacting radar sensors can impact its performance. A lower frequency reduces sensitivity to vapor, foam, and contamination of the antenna, whereas a higher frequency keeps the radar beam narrow in order to minimize influence from nozzles, walls, and disturbing objects. Beam width is inversely proportional to antenna size. The beam width of a given frequency will decrease as the antenna size increases. The achievable accuracy of any radar level measurement system depends heavily on the type of application, the antenna design, mechanical installation, the state and quality of the electronics and echo processing software employed. Even though the effects of temperature and pressure variations are very small, compensation methods are still being used for these parameters. Other influences on accuracy of radar level instrument include signal to noise ratio and interference. Radar level instruments are widely used to measure the level of liquids, slurries as well as many solids in storage tanks in refineries and tank terminals. These instruments operate in a wide range of temperatures, pressures, vapor gas mixtures and various process conditions. Radar instruments are quite specific in their application of use. Radar level measurement should be avoided as much as possible on solids due to the weak signal reflection that occurs. Non-contact radar sensors perform poorly with low dielectric process fluids. With low dielectric process fluids, much of the radiated energy is lost to the fluid, leaving very little energy to be reflected back to the gauge. Water and most chemical solutions have a high dielectric constant; fuel oil, lube oil and some solids, such as lime, have a low dielectric constant. Their application is not suitable for these kinds of low dielectric fluids. If the surface is turbulent, whether from agitation, product blending, or splashing, more of the signal is lost. A combination of a low dielectric fluid and turbulence can limit the return signal to a non-contacting radar sensor. To solve the problem of turbulence, bypass pipes or stilling wells can be used to isolate the surface from the turbulence. •They are very expensive. Price increases with increasing accuracy.